Forum Index > Off-topic Talk > English longbow, where to buy one in europe? Posted: Mon 08 Feb, 2010 12:57 am Post subject: English longbow, where to buy one in europe? modern recurved flatbow with a draw of 45 pound for my practice. i have found a lot of shop online but considering that i'm new to the archery world and some of the price that i have seen are very high, i need an advice for a good value longbow constructed with traditional metod. Don't buy a longbow online; especially as you are a beginner archer. I've seen some shockingly bad rubbish sold as bows online; to be honest you could almost do better yourself. Even if you don't buy from him (and I recommend that you do) talk first to Master Bowyer Steve Stratton, at www.diyarchery.co.uk. He is, by far, one of the most knowledgeable medieval warbow bowyers in the UK; if not the world. He does extensive research with the Mary Rose trust and Westminster Abbey, amongst others and has worked with such notable researchers as Dr Anne Curry. Personally, I wouldn't trust any other bowyer for my bows. I would agree with Glennan that Steve Stratton is a man knows his stuff and makes damn fine bows - I have one myself. I would also say Chris Boynton of Boynton archery makes fantastic bows and also have one of his. Both are very approachable people so have a chat with them. I would happily buy bows over the phone from them but very few others so I would say any maker you are absolutely not sure of look at his bows in person first. A decent lamiated bow should cost you about £180-£300 and a self yew bow about £400 upwards. If you are paying less than this there is a good chance it is not a decent bow. While we're on the subject, where's the best place to get a self yew English longbow and/or warbow in North America? Try Don Adams in Oregon or Marc St. Louis in Ontario. Both are fine bowyers. English bowyers will ship to the US, but the carriage might be extortionate. from a shooting proiperties point of view there are many difference between a self and laminated bow? Those are really good guys, but they're also pretty high end. a friend of mine who is a blacksmith and carpenter by trade recently did a bunch of research and made himself a traditional longbow. shoots wonderfully, about as exact a copy of the mary tudor pieces as you can hope for, and he mostly makes weapons to make them, so he doesn't tend to charge a lot (he makes 4-5 grand on custom cabinetry, weapons are his hobby). i can't promise it will be as nice as those, but if you're interested i can ask him about making another for you. PM me if you're interested. A typical MR bow draws somewhere in the region of 140 - 150lb at 30". I know of only a dozen or so people in the world who can shoot that comfortably (and certainly well enough to say whether the bow is 'wonderful' or not). As to the question of why a laminate bow is cheaper: it is cheaper because it is easier. A self-bow must be 'carved' out of the wood. Being a natural material it will not be homogeneous throughout the stave. The bowyer must find the strong and weak points in the stave, to produce a shape that, when bent round will form a good shape. This takes patience, skill and experience. A laminate bow is made from strips of material glued together (to form a nice uniform stave) and is therefore much easier to shape and, if shaped evenly, should bend uniformly, so will be easier to tiller. With all due respect, unless you have studied the MR bows in person and imported a nearly flawless stave of high-altitude European yew, then the bow your friend made will not be an exact copy. with respect, that is why i said "about as close as you can hope for" in the context of a budget alternative to the great makers mentioned above..
also, the guy uses a 15lb sledge on a 1 foot haft instead of a power hammer. i have no doubt he can draw that weight. i tried to draw his crossbow (he doesnt use a goats foot or winch) and it quite literally ate my hand, i still have a scar. i'm 6'2", 200+ pounds, and in fairly good shape, it gives him no troubles. Arguing about this is not productive: I have my opinion; you have yours. They are based on different expectations and experiences. I believe though am not certain that lamite bows were known of in the renaissance and perhaps before but would have to be considered rare. Thery are cheaper because they are easier to make and because the very fine wood required for a decent self bow which comes at a cost is not required for a laminate and you can get as good if not better performance from a laminate as a self bow. If you want fun and performance there is no reason to avoid a laminate. They are both high end makers but if you want confidence in buying the right thing on line from a guy you don't know I would again say they are good choices. If you want to go lower end, a very average maker can turn out a reasonable lemonwood/ash or lemonwood/hickory bow that will be fun to use and last well. Expect to pay about £120 for a decent enough weekend fun bow and in retrospect that is perhaps what I should have suggested first off. As regards drawing big bows I will tell you my story; sorry if it is a little off track. I have known shooters of 110-150lb bows for a few years and thought it was all about strength - I am not that strong so I didn't give it much thought, it was never going to be for me. In the summer I started chatting to a lady friend who is I guess about 5'4 or 5'5 and certainly no blacksmith and she shot an 85lb bow. As I do physical work and I shoot a 55 I started thinking..........I know Steve Stratton and he weighs in at about 101/2 stone and he shoots a 120lb and certainly no bag of muscle (no offence Steve if you read this) and I concluded that as Glennan keeps banging on about, it is not all about strength it is about technique. That evening I went down to the clout range used this ladies 85lb bow with a standard arrow and some coaching and shot 30 yds further with an arrow at least half as heavy again as I have ever shot. Only 170yds or so but it was no small arrow; 1/2" x 32" if remember right. I am now the proud owner of an 85lb bow that I cannot draw - I need a few more coaching sessions, but I have no doubt that after a weekend of shooting in the very very different style required of this bow that I could contemplate a 100lb. There is no way I could draw a 75lb repeatedly using the straight Victorian draw I currently use let alone a 100lb. From my view as a shooter of 34 years using one style, to try another style was utterly revolutionary, eye opening and personally I was running around with a huge grin after my revelation. In terms of archery it really was my 'road to damascus' moment - I suddenly got it. Just because a man is strong it does not mean he can draw a 150lb bow and just because a man is small it does not mean he cannot. How many bench presses of how ever many pounds simply has very little relevance to the discussion of bow weights and did they didn't they. I bet many of you can not draw this ladies 85lb bow and I bet she cannot bench press half of what you can. Different things. my actual bow, but as mr.Tod has pointed out i think that phisical strenght is not the main factor involved with archery, and my technique is still too bad. while i'm waiting to became proficient enough to acquire an high end, high poundage bow, that is my main goal.May be that a laminated longbow like the basic model offered by mr.Stratton would be a good choice for me, but if you have some other respectable seller based in the uk or mainland europe to raccomend i would be happy to receive some other imput. I would agree with your instructor that a 40 or 45 would be more than enough for a starter. look to pay about £120. all make or supply good bows like this and there will be loads of makers in Europe and near to you also. Why not ring up some of your local clubs and ask where they get theirs? ...it is not all about strength it is about technique. I bet many of you can not draw this ladies 85lb bow and I bet she cannot bench press half of what you can. Different things. That may be true, but she probably can lift a decent amount with bent over rows. I completely agree that technique is a major factor in drawing heavy bows, probably bigger than strength, but strength has it's role too, just a lot of people don't know which muscles are required in drawing a bow. It's mainly the upper back muscles (Trapezius and Rhomboids) and shoulders (deltoids) with a little help from the Latissimus Dorsi on the drawing arm side. These muscles are often neglected in workout routines and don't see much use in everyday activities and therefore are often weak. I've personally trained these muscles specifically for bow drawing and have found drawing much easier with well-conditioned muscles. The purpose of proper technique is to correctly put these muscles to use in order to push them to their highest potential (which standard Victorian draw doesn't do). As Tod mentioned, it's much more difficult to draw a bow with the Victorian style than with the warbow draw style. Tod, I've experimented with drawing techniques and have found some that work better than others, but I'm not sure I'm actually drawing in the style you're talking about. I don't know of anybody nearby who does this or any clubs that would teach this. Are there any other resources (books, internet) that would illustrate this method? Muscle strength is definitely a factor, but only one of many, including tendon strength, technique and even your physical proportions (wide shoulders and short arms is better than narrow shoulders and long arms). 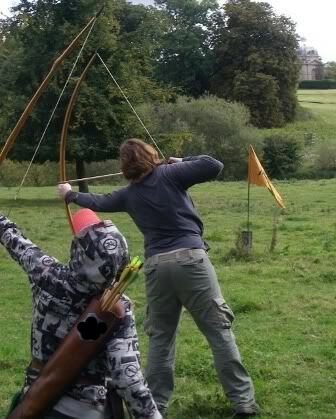 Here is a picture of me at full draw with my bow. You can see the muscles at work very well in this photo. You can also see my bow arm in the 'locked-in' position. In this position all the weight of the bow is directed into my skeleton; the muscles provide stability only. Final point (while I notice it): Note there is no arrow hanging off the end of my bow at full draw. Any arrow shaft projecting from the bow adds nothing to the shot. It is merely 'dead weight'. So cut it off. Many archers, not confident of their technique enjoy the 'comfort blanket' of some extra arrow shaft in case they draw the arrow inside the bow (or shoot themselves in the hand). If you understand the mechanics of the draw, this will not happen. what about Fairbow products? they look incredibily good priced, they horsebow looks interesting too. Fairbow is a one-stop-shop for all things related to traditional archery. They are a reasonable place for beginner's equipment, as they can supply you with everything you need to start archery, without breaking the bank. Even so, i would definitely seek out and chat to specialist bowyers before you buy anything. It will cost you the price of a phone call; but could save you a fortune. Thanks Glennan, that's very helpful. Gabriele, I have no personal experience with Fairbows, but their products look very good to me. I'd trust them. Good luck in finding a bow.